What is the best practice to secure a 17ft open canoe to the roof of a vehicle? Next month, my kids and I are enrolled in a canoe building workshop in the Lake District of the United Kingdom. At the end of the 4 days we will have a 17ft canoe weighing between 16 and 22 kilos. Our return journey is over 200 miles using mainly motorways. We have a mid-size MPV vehicle with built in roof rails and attached Thule roof bars. 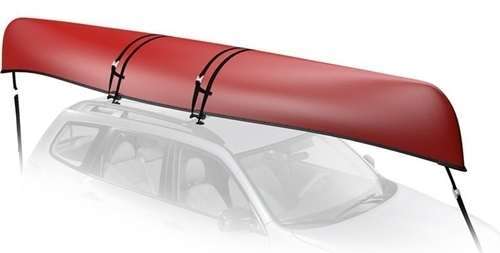 What is the best practice for attaching and securing an open canoe to the roof of a vehicle? Is it the same as a kayak (which has similar questions here on TGO SE? I have never transported any outdoor equipment on the roof of a vehicle previously. Best is if you have roof racks. A: Secure mid point of the canoe to the back of the roof. B: Secure the stern of the canoe to the rear bumper, preferable as close to the corners as possible. C: Secure the other end of the canoe to the front bumper. Don't cheap out. Use nylon rope. It has a bit of stretch to it so that it doesn't go from tight to floppy with the relaxation of 2 mm. 1/4" (6 mm) or 5/16" (7.5mm) is sufficient. It can be twisted or braided. Polyester rope has very little stretch. Sisal and manilla rope change dimensions if they get wet. These work well too. If you have long lengths of ratchet strap in the wind, they vibrate like crazy. Put about 1 half twist to 1-2 feet to reduce the vibration if you find it annoying. Ratchet strap hooks aren't as flexible for attaching to either the canoe or the car. In some cases you can use a rope loop at one or both ends. I don't like the camlock straps. I've had those loosen up on me on several occasions. I have more rope than ratchets, so the rest of these instructions deal with rope. Adapt to your situation. Run a line with several turns around the crossbar, using a knot like a pipe hitch, double catspaw, or prussik. The idea is you don't want the rope to slide on the cross bar. Wrapping the bar with wrinkly duct tape or hockey tape may make this easier. Repeat on other side. At this point you have two ropes attached to the roof rack crossbar in a way they can't slide. One rope should be short enough to not reach all the way across the canoe. Put a bowline in the end. Run the other rope through the bowline, pull hard and tie. Repeat the above steps for the other cross bar. You need to keep the gunwales from scratching your roof. Canoe stores sell foam blocks for this. You can also take a pool noodle, cut into 1 foot chunks, slit one side to the hole in the middle, and clip this around the gunwale. I have also used life jackets. PITA. Now you have a rope with a high traction surface. Treat the rope like you did the cross bars, and tie to it. Having knots in the rope on either side of the door opening so that the whole loop cannot shift once the door is closed is a good idea. Secure to the car's corners. Some cars don't really have a bumper. You may need to go underneath and secure to the frame. If you will be doing this a lot, you may want to add tie down eyes on whatever you do have at the corners. Do not tighten this yet. Get snug though. The wind force on the canoe is going to try to push the canoe back. If the bow is in front of the bumper, then, if you tie to the bow, you just pull back more. Canoe slides, and ropes go slack. Instead use the bow seat as your tie point. Tie to a corner of the car, take a turn around the seat, go over the canoe, take a turn around the seat on the other side, and down to the corner. The idea is that the turns around the seat keep the the rope from sliding forward, and the loop over the bottom of the canoe takes most of the strain off the seat. If the bumper is unusable, open the hood (bonnet) secure lines to some part of the frame, and run out under the sides. There is going to be strong forces on these lines. Take care that you don't damage your car. The hood is latched only at the centre. You want to run the ropes in a way that doesn't pull up on the corners. At this point the front ropes are vertical or sloped back toward your windshield. If they are sloping forward, you need to move the whole canoe back on your car. Tighten the ropes. Roof, bow, stern. If you are using foam blocks or noodles, you want to see them squish. If using a roof rack, pluck the ropes. Play music on them. Often once you get going, things loosen up. Drive 10 km, and stop and check. I've had canoes turn on my roof, due to the canoe sliding back, and loosening the front lines. This will put a substantial sideways force on the car. If it happens rapidly, you may have an interesting time. The smaller your car, the stronger the effect. Stop and check at 10 km, 30 km, and every time you stop for to 'rest' and buy petrol. In passing, I'm impressed with a 4 day workshop that can produce a 22 kg 17 foot canoe. This sounds fragile. That's a light canoe even made from modern composites. Run these directions past your instructor. He may have additional comments. It's called the keelover. 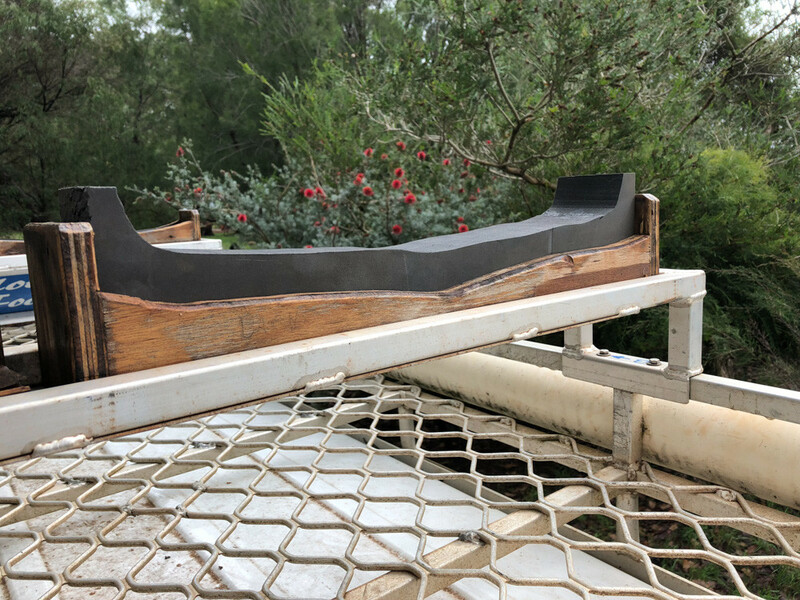 It uses four brackets to hold the gunwales so the craft doesn't slide side to side or front to back, two boat straps to hold the canoe down on the roof rack, and one on each the bow and stern to prevent the canoe from twisting and torquing on the roof rack. If you want to to be extra secure you can use two straps front and back. I've used the foam blocks, and every method of strapping and tying a canoe down to roofs and racks with ropes and ratcheting straps. The keelover out performs them all. Position the canoe centered between your cross bars. You can use foam padding (e.g. pool noodle) between the crossbars and gunwales if you want to protect your gunwales. With stout cordage using a truckers hitch knot or Cam Straps, tie the canoe to the cross bars. Tie the bow and stern to the outside corners of the vehicle. This prevents the canoe from rotating from a crosswind. Check the tension of all the knots after 5 or 10 miles, then every time you stop afterwards. The trucker's hitch knot or cam straps are easy to adjust during these stops. This is difficult, since every boat/ vehicle combination is unique and so there is no one "silver bullet" method for rigging that will work for all. However, there is one principle that I apply to each rig I do, that allows me to adapt to almost any scenario: prevent motion in all six directions- Up, Down, Left, Right, Forward, Backward. The vehicle itself pretty much takes care of Down. One or more straps tossed over the boat and secured to the roof (or possibly run through the door frames and tied inside) solves Up, and with a little tension, begins to resist Left and Right. For forward and backward and to finish off left and right, I typically do V-shaped harnesses with the point of the V at the bow and stern, and tying off to where ever I can find on the vehicle. This has included running boards, bumpers, bases of rear-view mirrors (be careful with this one- in fact, I don't actually recommend it) trailer hitch receivers, and even the under carriage. You just have to ensure that the angles of these harnesses are opposite the direction of movement you want to check, i.e. a rope that runs forward prevents Backward, but not Forward (you can't push on a rope). Interesting how everyone is carrying upside-down. We have two 5m fibreglass kayaks (based on Zegal Greenlands) that we carry on the roofrack - right-side up. I have made two strong rectangular plywood boxes for each kayak, and each has a substantial, form-fitting EVA foam insert that the kayak sits in. These sit under the internal bulkheads in the kayak, and I use rated straps to hold them down - very firmly - and a lead rope to the front bull-bar. 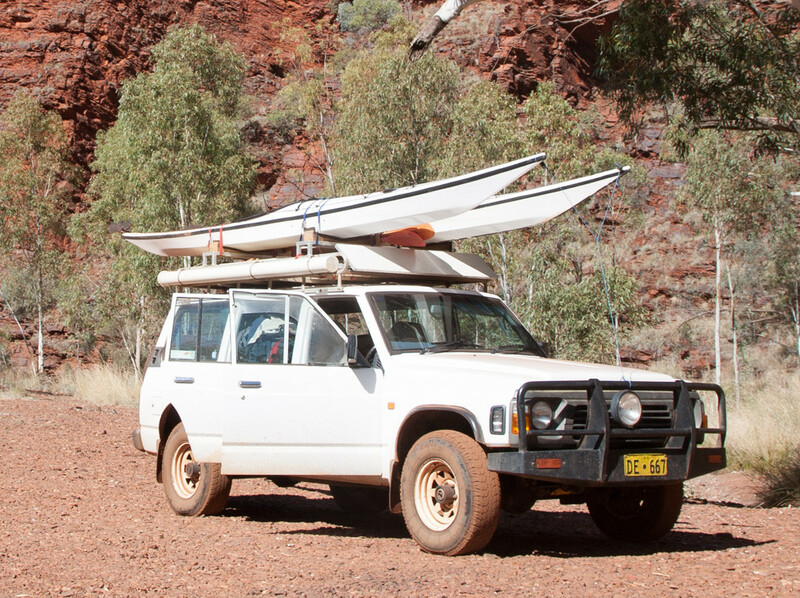 (The kayaks sit somewhat behind the front of the car - which is a significant 4WD.) Yes, there must be some lift generated by the hulls, but the proof of the system is 5,000km traveled on a recent holiday - including days on very rough tracks in the north-west of Australia - with no movement! This system allows me to slide the kayaks onto their holders (which are quite high), and access the storage hatches. Canoes are easier than kayaks because the gunwales provide four nice contact points on the roof rack bars. The first step after getting the boat on the rack is to position it in the best location compared to the front and back of the car. This will depend on the relative sizes of the boat and the car. First find the rough center of gravity, where an equal amount of weight is in front of the front bar and behind the rear bar. You do this by pushing up on either end until the force required seems roughly equal. You probably want to move the boat further back from this point. The main disadvantage to having too much of the boat over the front windshield is that it blocks your view more than necessary. (It's also worse for aerodynamics) But you don't want to move it so far back that it will fall off before you tie it. Also, the more of the boat that is sticking out behind, the more likely you are to hit something with it. Now attach a strap over the boat on each of the rack bars. You can do this with rope, but webbing straps are faster and also easier to get tight. You can use either a strap with a buckle to form a loop or a ratchet type strap. All you are trying to do is get the strap under the bar on either side, and then tightly over the boat, which holds the boat firmly down on the rack. Add some twists to the strap where it rests against the boat. At highway speeds this will reduce the noise from the strap vibrating against the boat. Now go to either end of the boat and try to move it, side to side, up and down. The straps should be tight enough that the whole car moves, not the boat relative to the rack. If you are just going a few miles in the city, many people who do this frequently will stop there. But I also secure the bow and stern to the car. Once you have attached the back of the boat, you may not be able to open the hatchback or trunk (boot), so load that first. You can use ropes or straps at the bow and stern. I have a set of four ratchet straps, so I use the remaining two. If you use rope, tie a trucker's hitch, which helps to get it tight. Find something sturdy at the end of the boat to attach your strap. And you'll have to find an attachment point near the bumper of the car. Ideally your car will have tie-down loops under the car at either end. I match the bow and stern ropes to the number of tie downs. If there is one, I do one strap and if there are two, I make a triangle. Once you get going, check your straps after a few miles, and occasionally after that. Some kinds of straps can stretch when they get wet, so re-check if it rains. Failure Modes/Effects Analysis (FMEA): basically think through what might go wrong and take more precautions for failures that might kill someone vs. failures that would just scratch paint, dent roofs, damage the boat, etc. Specifically, do not let the canoe come loose from the car on a freeway for any reason. If it’s bouncing around destroying your paint that’s your risk to accept, just make sure it can’t come completely free and cause a high-speed accident for the people behind you. Redundancy / avoiding single-point failure: one way of achieving safety is to have more than one system in place. The classic example is a twin engine aircraft: two completely separate engines which are not connected to each other at all and even have their own separate gas tanks provide a real margin of safety. However there is only true redundancy if the systems are independent. For example two ropes tying the boat to the rack provides redundancy to a rope breaking but not to the rack coming off the car. Six degrees of freedom: Solid objects in ordinary life move exactly six ways no more no less. They translate three ways (forward and backward, left and right, up and down) and they rotate three ways (roll, pitch and yaw). So for each way it might want to move, something (a rope that pulls on it, a bar that pushes on it, something grippy that keeps it from sliding) needs to stop it. Leverage: it takes less force to pull on the end of a lever than it does to pull somewhere in the middle. So for example if the canoe is trying to pitch up and down or yaw side to side because of wind, a rope at the end will have less force on it than a rope close to the middle. “Human error” is often avoidable: use of ropes introduces opportunities to do something wrong with your knot tying. It’s harder to screw up using a cam strap. This point is debatable and will depend on your personal familiarity with knots. Cam straps like ropes must be checked to verify they are in good condition. Closely related: inventing new things is risky, it’s hard to anticipate everything that can go wrong. If you can use something off-the-shelf that someone else already tested a lot, that’s usually much safer. Making products is hard and you often get what you pay for: built into the price of a good rack from a top brand are things worth happily paying for like materials, workmanship, manufacturing quality control, engineering, testing. It’s so worth it. I’ve loved the Yakima and Thule racks I’ve owned, amortized over years of use their cost per trip was minimal. Buy a good rack, and strap the boat to it using foam pads that not only protect the boat but also provide friction that keep the boat from sliding around when the straps are tight. In addition use bow and stern lines, each in a triangle from one point on the boat to some point on the corners of the car, to keep the boat from yawing or pitching in the wind, and provide independent redundancy that keeps the boat at least attached to the car even if the rack fails somehow. Take advantage of the experience of the boatbuilder instructors who have probably done this a lot to come up with a great solution for bow and stern lines for your particular car (ways of wrapping around the bumper to hard points underneath, or bringing a strap through the gap beside the hood to attach to some hard point under the hood). Not the answer you're looking for? Browse other questions tagged canoes or ask your own question. I put a big gouge in the bow of my canoe going across rocks. How can I fix it? What is involved in taking a canoe through a lock on a major US River? What is the best way to store paddles? 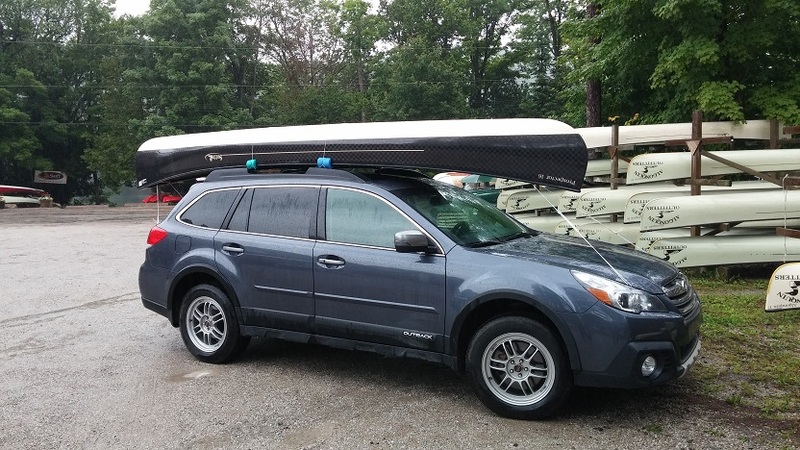 Is it safe to tie a canoe to the top of your car like this?